Tottenham has a range of green spaces from the wilds of Tottenham Marshes in the Lea Valley to the East to the largest green space, and community hub, of Lordship Rec. The grade 1 listed 16th-century manor house, Bruce Castle, holds the borough archives and the adjoining park has the area's oldest tree, an oak which is 450 years old. There are many Friends groups ​so that you can find out more and join in the campaigns to preserve our natural environment. A number of the parks in Tottenham have Tree Trails available on the free app, TiCL, click on the link below the name of the park. Haringey's oldest park with a 16th-century manor house tracing Haringey's local history and the oldest tree (an oak) in Tottenham. 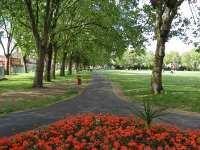 Lordship Recreation ground is the largest green space in Tottenham. The Eco Hub is the centre of activity in the park. Tottenham Marshes is a valuable and enjoyable green space for wildlife and for the whole community to enjoy. This green space by the River Lea, with playground, cafe and gardens hosts the Markfield Project community centre and the Markfield Beam Engine and Museum. Haringey Friends of Parks Forum is the independent and very successful umbrella organisation and network for the 30 local Friends groups of Haringey residents who are active in 'taking ownership' of, and protecting and improving, our parks and open spaces. Friends groups hold regular well-represented meetings of the Forum every 2 months, and the groups communicate and co-ordinate through the Forum’s email list. A park hidden off West Green Road with a playground which is described as a 'hidden loveliness'. An open space with a playground and multi use games area. According to Haringey Council: Surrounded on two sides by water, the Paddock provides an important refuge for water birds and other aquatic animals and plants. The wilderness area in the centre of the Paddock has grown naturally to form young woodland and scrub dominated by elder, willow and blackberry, providing a valuable site for various animals. The Paddock is one of 60 sites of importance for nature conservation within the London Borough of Haringey. These sites provide a valuable habitat for wildlife and the opportunity for people to experience, learn about and enjoy the natural environment. These sites are rich in wildlife, but have been neglected. Now a private developer wants to build over them. The Council has rejected the applications but the developer has appealed. We want the Inspector to reject the planning appeal by the developer; and Haringey Council to actively support an alternative future for the site to make it better for people and nature. Why is this important? Contact with green places and nature is important for our well-being. Ten thousand new people are coming to Tottenham as a result of planned development. But Tottenham has lost many green open spaces - so we need to save and improve what we have left. The North Eastern Fever Hospital, now St Ann's hospital, opened on 8th October 1892. 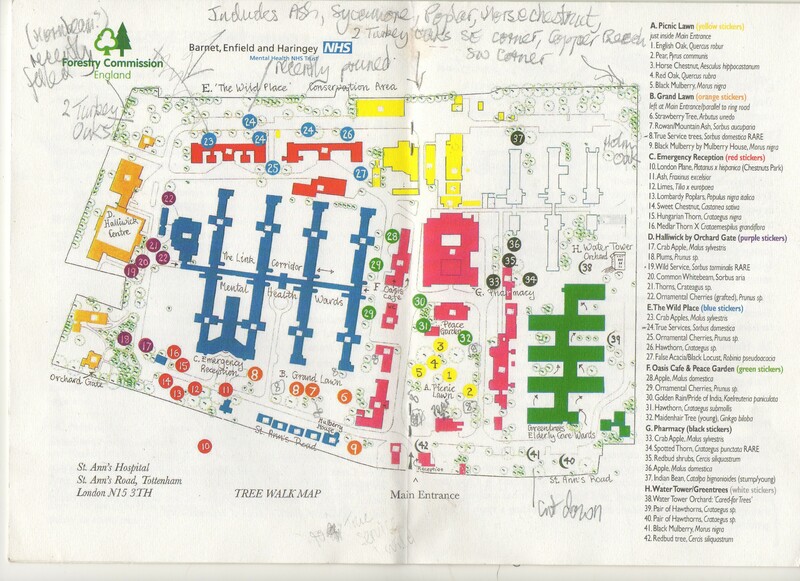 By the beginning of the 20th century the Hospital had 548 beds in extensive grounds due to the nature of the patients illnesses which required isolation. During the 1920s the gardens were laid out by a former employee of Kew Gardens, who planted trees which were reputed to be of therapeutic value. StART (St Ann’s Redevelopment Trust) - The Trust wants to acquire the site, which still has several grassy areas, trees and hedgerows for the benefit of the whole community. The study also recognises the need to retain, improve, upgrade existing sites and the biodiversity value of open spaces in Tottenham. 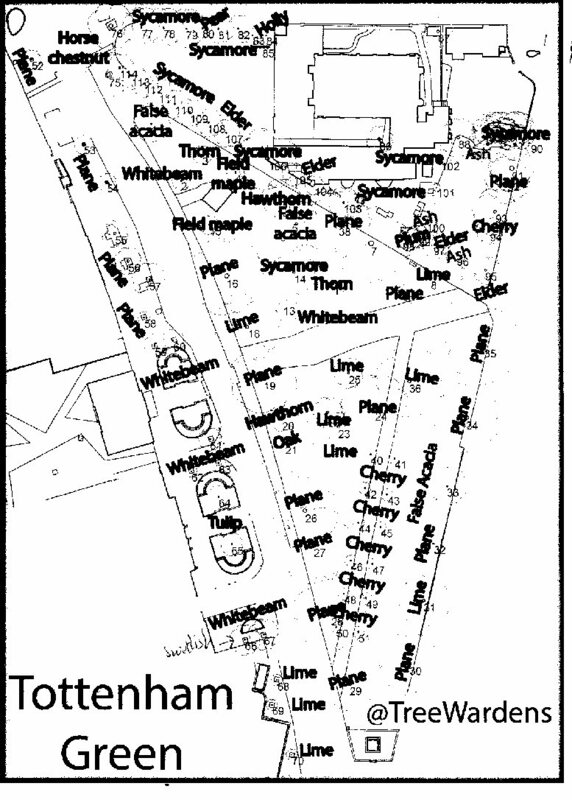 Tottenham is mentioned in Joyce's Ulysses and the title of the map is from Finnegans Wake. James Joyce quotes follow the name of trees mentioned.